Working on a PC or laptop that's connected to the internet offers lots of advantages. But there are plenty of disadvantages too. Our laptops, USB sticks and CDs help transport documents, photos and movies all over the world. But what happens if a stranger gets a hold of the data on your hardware? USB sticks with irreplaceable vacation photos can fall out of pockets. DVDs that contain personal financial information get lost all the time. Laptops with e-mails, contact info and calendars can be accidentally left behind in taxis. All your passwords are neatly stored on an Excel sheet. But unprotected documents leave you vulnerable to data thieves. You've deleted all the data on a PC you plan to sell. But did you know that someone could easily reconstruct the data you thought was gone forever? The solution to all of these problem is Steganos Privacy Suite. 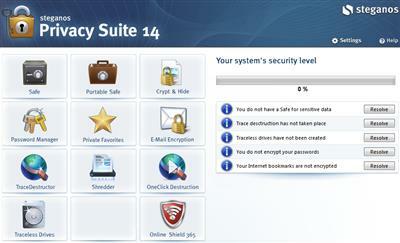 - Encrypt - Secure your files with the Safe. - Level of Security - Observe your over-all level of security at a glance. - Delete - With Shredder and Trace-Destructor you can eliminate files and your Browser history for good. - Overview - Passwords and Favorites are securely stored and automatically populated.